Have you heard the mysterious noises emanating from the second floor? 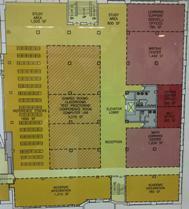 Are you wondering what the second floor will look like when the renovations are complete? Joanne Quinn, design specialist, and Kristyna Carroll, research librarian, created and mounted a large double-sided display that can answer your questions about what is happening on the second floor. The windows facing the first floor welcome Falvey’s new residents to the Learning Commons, which will include the Writing Center, Mathematics Learning Resource Center and Learning Support Services. There are panels with descriptions of the services offered by each area of the Learning Commons; these panels include QR codes. Use your smart phone to read the QR codes and to find out more about their services. A floor plan shows how the second floor of Falvey Memorial Library will house the Learning Commons, presentation rooms, study areas, academic integration (librarian) offices and offices for the library director and his staff. Across the bottom of the window are photographs of the second floor under construction, linked by bright yellow caution tape. Tentative plans for the second floor of Old Falvey include space for Library resource management, outreach and communication office space. A cross-sectional drawing of the two buildings, Falvey Hall and Falvey Memorial Library, reveals how they could eventually be linked by an atrium. This phase of construction will be dependent on a capital campaign. In the window facing Holy Grounds is a large Project Timeline that reflects which projects are finished, those in progress and the ones still to come. 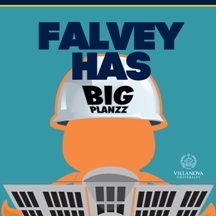 There is also a “Falvey has Big Planzz” sign and a free-standing cardboard easel showing two seated construction workers whose faces are cut out; they can be used for photo opportunities. If you keep an eye on the timeline, it will keep you informed of the progress being made in this important renovation project. You can also get a project overview on our Renovation News webpage and by watching our news blog for updates.